Wagyu Shimeji, originally uploaded by Camemberu. At last! 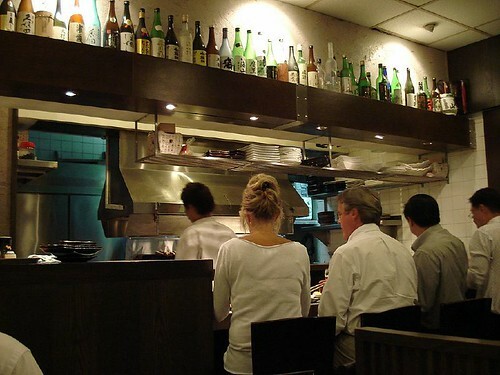 Kazu - the shrine of all yakitori/kushiyaki in Singapore. Hubby got home early amidst all the earthquake tremors that rocked this little island today, so we were able to make it to Kazu before the crowds descended. 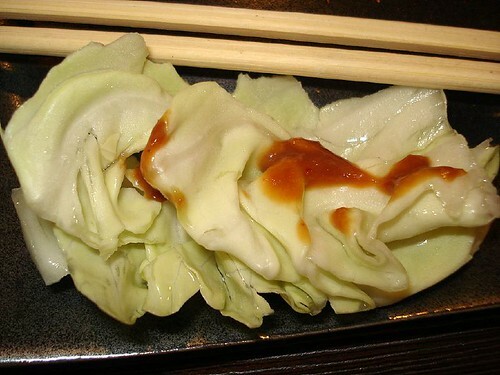 Refreshing complimentary raw cabbage salad appetiser, originally uploaded by Camemberu. Kicking off the evening was the superb complimentary appetiser of an ice-cold refreshing cabbage salad (is it some miso paste? I can never figure that sauce out). We aren't fans of cabbage but liked this so much we ordered a second round (S$3). Wagyu shimeji (S$4.50), bacon shimeji (S$3.30), bacon enoki (S$3.20) and buta bara (S$1.50), originally uploaded by Camemberu. Yes, this is all quite delicious. The bacon and beef wrapped around the various ingredients are sliced so very thin, it's barely perceptible but it's there just enough to lend flavour. However, I think the wagyu around the shimeji was sliced too thin to retain much of its prized fats during grilling. Bacon shimeji and Aspara-bacon (S$3.20), originally uploaded by Camemberu. Kazu does a great job at seasoning and grilling its items - most parts are literally toasted crisp but sometimes certain parts are a little burnt in that big happy charcoal grill fire in the kitchen. 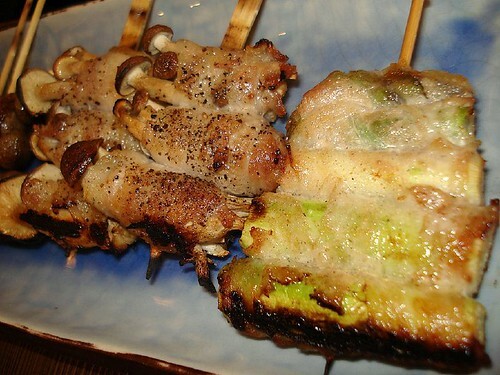 Kawa (chicken skin) and US short-rib, originally uploaded by Camemberu. I have to say the chicken skin at Wahiro's Kushiyaki is still superior - that one becomes so crisp and tender at the same time, you can't tell that it's skin anymore. Although well-grilled, Kazu's version (S$1.80) is still recognisably chicken skin. The US short-rib (S$4) is hubby's favourite of the evening - he ordered it three times! Juicy and tender. 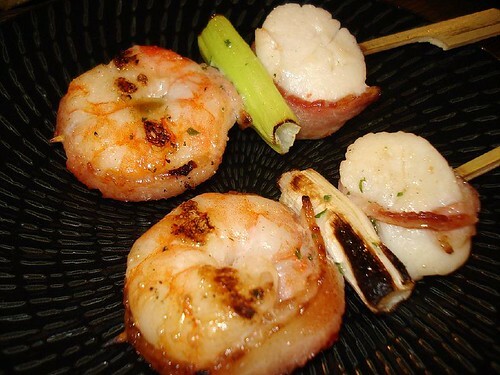 Grilled bacon-wrapped prawn and scallop (S$4.50 each), originally uploaded by Camemberu. This is easily my favourite item there. Big, juicy prawns bursting with intense flavour, and sweet, fresh scallops made all the more aromatic by the grilled leeks (I don't normally eat leeks, but these were beautifully soft and melt-in-your-mouth). 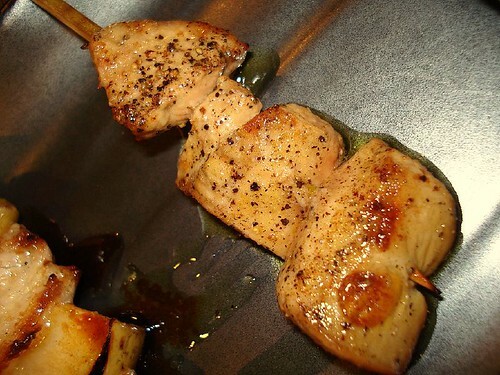 Foie gras on a stick (S$6.50), originally uploaded by Camemberu. Hubby had his first taste of foie gras (he is normally not that adventurous with livers and innards). "Tastes like butter" was the verdict. Yes, they were not bad but I would prefer these just slightly more charred on the outside, searing in all the buttery goodness. 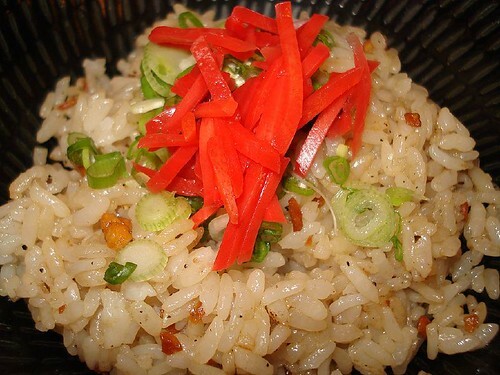 Garlic rice, originally uploaded by Camemberu. We needed some carbo to fill us up as the grilled stuff was like bitesize hor d'oeuvres. I had a garlic fried rice (been a sucker for this dish ever since I tasted my first at a teppanyaki joint in Tokyo). I guess Kazu's was decent (although a wee bit pricey at S$6 with nothing but garlic in it). The garlic was charred just to the point of almost turning bitter. Almost. Hubby had a delicious zaru soba (chilled buckwheat noodles, S$8) - very good indeed - springy and delicious! Too bad no pictures. Unfortunately for both, portions were rather small. 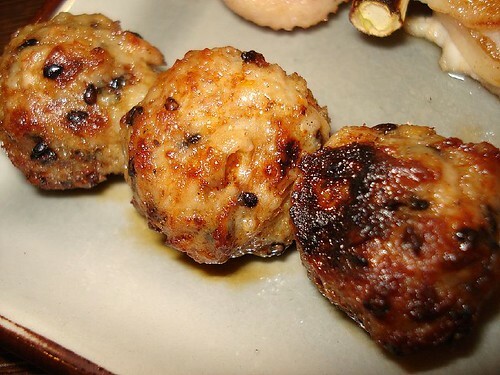 Tsukune - minced chicken meat ball (S$1.90), originally uploaded by Camemberu. I could tell quite a few ingredients went into this trio of meatballs but somehow I prefer Kushigin's version. 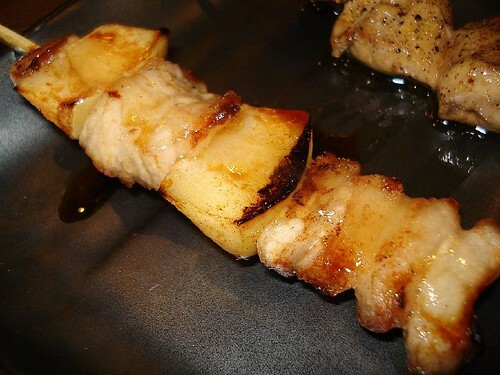 Tontoro ringo - fatty pork with apple (S$3), originally uploaded by Camemberu. Nice combination of flavours but the pork was probably a bit too fatty for my taste. (Yeah, I know, it's kinda strange cos I love pork lard and yet am afraid of fatty pork). 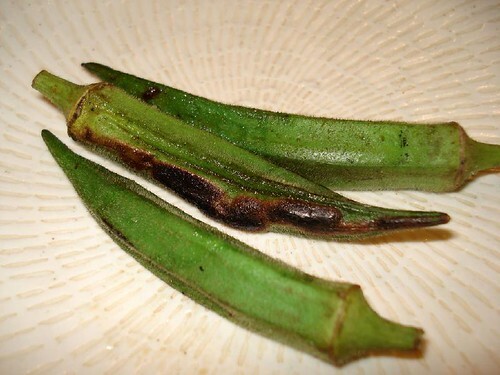 Grilled Okra, originally uploaded by Camemberu. The obligatory vegetables, hehe. A tiny trio of Japanese mini okra (lady's fingers, the size of your pinky!) nicely done. However, at S$3.50, I'd think twice about ordering these again. 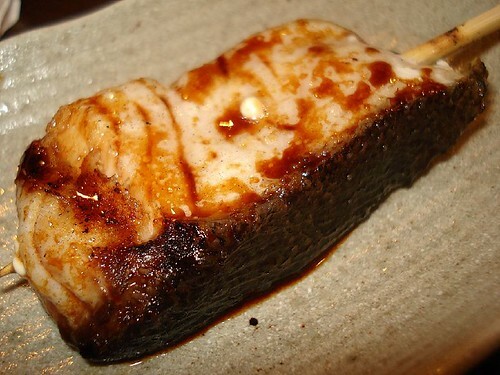 Gindara - beautifully grilled cod fish, originally uploaded by Camemberu. Oh this was lovely. Kazu seems to do seafood quite well. Fresh succulent cod (S$4.50) without any fishiness. The flesh was fall-away soft - I just wonder how they manage to grill this so nicely that it stayed in one piece! 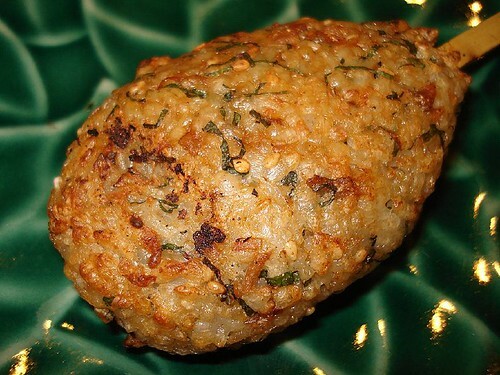 Yaki-onigiri, originally uploaded by Camemberu. I was still not completely full at the end of the meal though, so I got myself a grilled onigiri (soy sauce version, S$3.50). My, it had a lot of additional seasoning within it - you can see shreds of nori (seaweed), sesame and I could taste ume (plum). I still prefer my onigiri plain like at Wahiro's or Aburiya's. Final Score, originally uploaded by Camemberu. 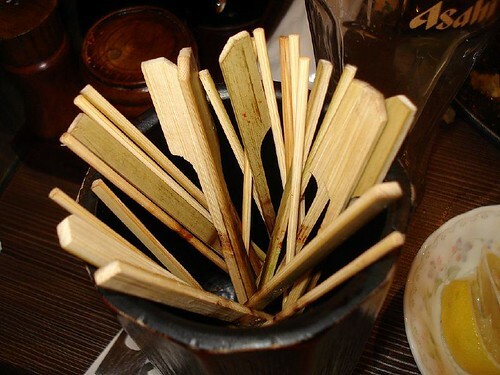 Here's the bamboo tumbler where you toss all your skewers. Think we ate too much? Well, the wallet says so, but my stomach says no. It's way too easy to go overboard here, with the enticing and wide variety in Kazu's menu. 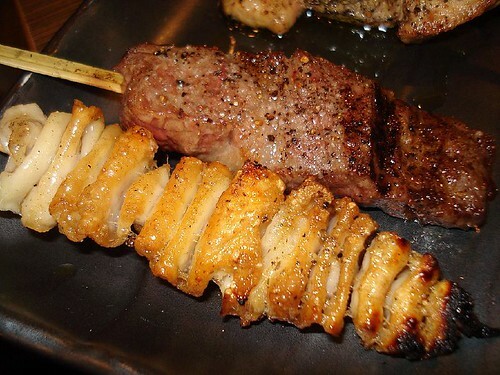 You just feel like trying everything (okay, maybe not the grilled whale's tongue or horse sashimi)! Cosy atmosphere without the smoky fuss, originally uploaded by Camemberu. Another plus is that the place doesn't get smoky despite all the heavy-duty indoor grilling, thanks to powerful and well-placed exhaust hoods. 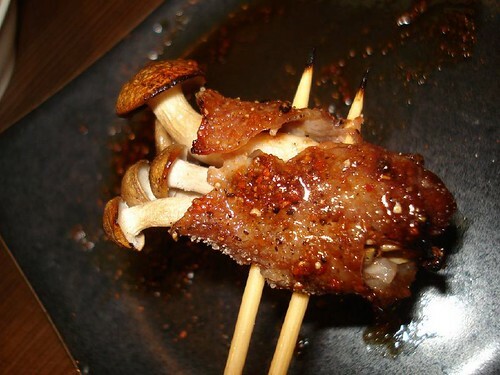 Kazu is a nice yakitori place. Tables may be small and cramped but the food makes it worthwhile. 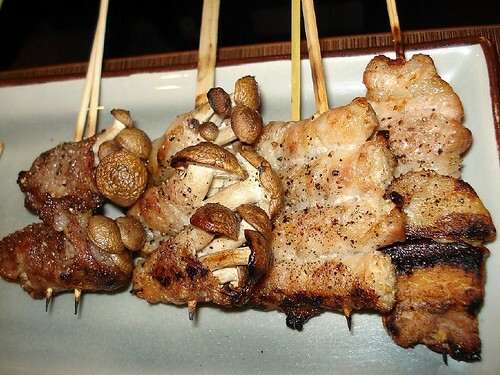 I can't seem to decide which of the three I like better: Kazu, Wahiro's Kushiyaki and Kushigin. Some items are done better at Wahiro's, some at Kazu's. Not sure if my memory serves me right but Wahiro's offerings seem more filling and substantial (also less hard-hitting on the pocket) but it definitely can't beat Kazu's menu variety. Wah looks nice, might wanna have a try with my friends. How much was the cost of the dinner? Is there such thing as a buffet there? meepoker and ladyironchef: haa, yes, I wish there was a buffet option too but sadly no. Most stick items there cost between S$1.90 - S$11 per stick, so total cost will depend on what you order. This dinner (with two beers) cost around S$120 (ouch!) for just two persons. hi camemberu, i really do enjoy ur blogs but maybe u could list some of the prices for the places u visit for the budget conscious?? just my 2cents worth..cheers! Hi Dan, prices now added to individual items on this post. Yeah, quite a few people ask me about cost of meals. I'll try to put these up more often. hahaha! thanks, in fact i think u should include prices in your every post, price-sensitive you know? lol! !